This post is sponsored by goodnessKNOWS. Thanks goodnessKNOWS! I’m not new to yoga. I’ve been doing it for years! When I follow yoga videos or take classes I’m the kind of person who always pushes herself to try the most challenging versions of poses, like opting to do wheel pose instead of bridge pose. But there’s one thing I’ve always been scared to try: the yoga headstand. Headstands were no problem with the support of the wall — in fact, I do them every week — but the thought of not having the wall behind me as a crutch terrified me. It’s funny when I think about it because what was I so afraid of? The max height I could fall from is like…one foot. You already know I dig goodnessKNOWS snack squares, so I was excited to work with them again for this post. There are six snack square flavors, but my favorite is still the cranberry & almond. goodnessKNOWS® also recently debuted a new, bolder logo design and new packaging that highlights those same, delicious ingredients on the front of the pack. Keep an eye out for the new look on shelves near you. Because my body is used to eating every couple of hours, it’s best to have a snack with me to prevent low blood sugar and HANGRINESS in case I can’t manage to squeeze in a full meal. 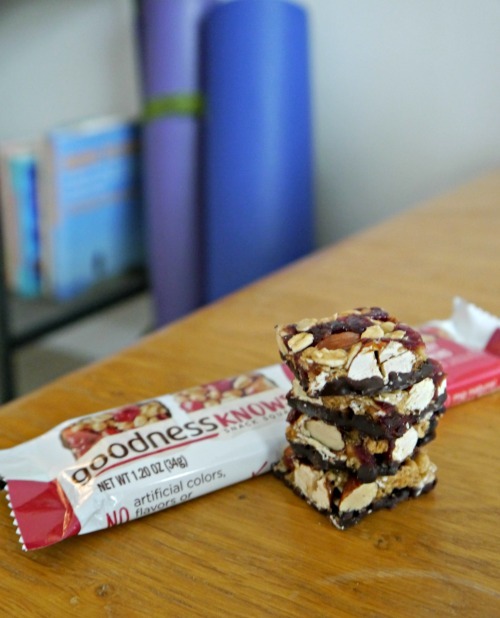 These goodnessKNOWS snack squares are a great solution, and they happen to be gluten free and non GMO, too! So about that yoga headstand…I’m happy to say that my first attempt was, in fact, a success. I couldn’t believe it! Yoga headstand attempt #1: success! Even though my form wasn’t perfect and I only held the headstand for a second or two, my joyful reaction afterward is completely genuine because I was so proud of myself. As someone who loves a good challenge, I decided to give it another go and see if I could hold the headstand a little longer this time. Looking at it from this angle I can see that I’m leaning off to the side a little bit, but that doesn’t take away from the fact that I HELD A HEADSTAND! If anything, it gives me an incentive to keep trying to improve. After all, every try is a step closer to my goal. And I think that’s what yoga is all about — progress. You can never master yoga, and that’s what I love about it. You can always go deeper into a pose, meditate for a little longer, or focus more deeply on your breathing. Wherever you are in your yoga journey, I invite you to celebrate International Yoga Day by joining the free yoga livestream this Wednesday, June 21 with goodnessKNOWS! Just grab your mat, head to the goodnessKNOWS Facebook page, and the class begins at 3:00 pm Eastern. I’ll be there! Will you? 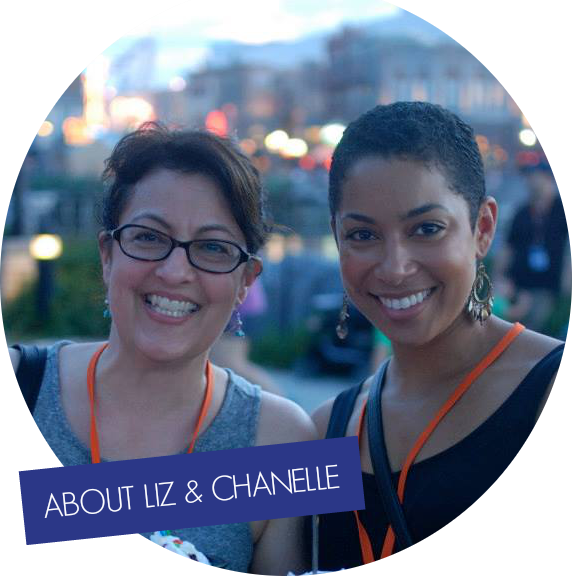 Whether you’ll be joining the stream or not, you can learn more about goodnessKNOWS at their website, or on Instagram, Twitter, or Facebook. And you can always check which stores near you carry goodnessKNOWS snack squares with the store locator! I’ve done yoga a few times and am definitely nervous about it because I don’t think I’m that good at it. I would love to take a yoga class and get better though. Oh those snack bars look delicious! I would need some when I am out running errands. I usually get hunger pangs during that time of day. Congratulations on completing a headstand! I could never do anything like that! I love those bars! They are an excellent afternoon snack that will keep you from over eating at dinner! They are really good. I like that they’re hearty but not heavy. I haven’t tried Yoga but I love to learn and change my daily activity I will try to find videos on how to do a yoga or will go to the gym with my sister. I always liked yoga. I’m not a Zumba person. I feel so clumsy and awkward. I don’t do yoga but I have heard of friends and family who said that their health has been good since they started with yoga. It looks like a fun way to get in some exercise though. Wow now that headstand is impressive! Ive been wanting to give yoga a try but something always gets in my way. This gives me motivation for sure! I took my first yoga class last night and it was AMAZING!! Totally loved it. As for this delicious bar, I’ll take a few, please. Totally not easy as pie but I’m glad you’re finally able to do that yoga pose! It’s nice to challenge yourself, you’ll never believe how much you can do! I’m a mess doing yoga period! So, you got this one! I’ll have to look out for these bars. I love a grab and go snack! Wow, you look amazing doing your headstand! That looks incredibly difficult. I do yoga (milder forms) here and there to help me with my migraines (mostly to prevent oncoming ones) – it really seems to work. I have never done yoga. This looks relaxing and easy to do. That was amazing! Congratulations for finally doing a headstand without any support! I’m sure you feel extremely proud! It’s also nice to have a snack nearby and these bars sound great. Congratulations! Your blog is the third place I have heard about yoga in the last 24 hours. I think the universe is trying to tell me something! I think your yoga headstand talent is amazing and I’m very impressed! lol I am really curious about yoga but am definitely at the very beginning of even attempting it! You are amazing, and that is so impressive! If I tried that, I’d be passed out on the floor probably! Congratulations! Your yoga headstand is amazing! Get it Girl!!! That headstand was fantastic!!! Good for you. I am looking into starting yoga and I am kind of afraid of starting. Look at you rocking that Yoga headstand!! I think you looked so graceful. Really. Jut beautiful. For your first headstand, it looks pretty great to me! I love how excited you are about it. Woah, this is so impressive! I like to do smaller yoga moves, more so for the relaxation techniques and stretching. But doing a headstand would be awesome to be able to do! That was an awesome headstand. I think if I tried something like that, I would end up in the emergency room, as I’m such a klutz. Much respect and a big applause on nailing the headstand! Keep it up! Wow great job on the headstand. I have been doing Yoga for a few months now and I am really seeing a difference. Awesome that you got your handstand at the first attempt! Rock on! You look fantastic and healthy. The last time I did a headstand, I was pregnant with twins, and it wasn’t a very smart idea. Don’t ask. I’m actually a bit scared to do them, but I will see, because what the heck, right? You had perfect form going into that headstand, even if you only held it for a few moments. Great job! I have been scared to try yoga. I am heaver and I don’t think I could do it right. I don’t do yoga but that headstand looks very difficult, congrats on achieving it. I will have to try those GoodnessKnows bars for a quick energy boost. Man, now that is awesome! I am totally scared to try these now that I am an adult. When I was younger I did them all the time! I keep GoodnessKnows in my purse and in the pantry at all times. They make great breakfasts when I’m rushed or snacks when I’ve been out all day. Total goals! You definitely rocked that headstand and I think so much of that has to do with your awesome overall fitness level and strength. Thanks for the motivation! Wow! You go girl! I am no where close to being able to do this, but I hope one day!! Congratulations on a successful headstand. I don’t think I would be able to do it. I haven’t even attempted one with a wall as support. You are quite the inspiration! I have been exercising now for about five months in although I have not had a huge amount of success I am trying. I think I need to get some yoga in also because I think it would help. Big props on nailing the headstand! I could never do that. At least not for a long time! I LOVE Goodness Knows! Those things make great on the go snacks. Good for you! I Have been wanting to try yoga for a long time, but I think I need to work my way up to a headstand.